Grosgrain Ribbon: 4", 2.25", 1.5"
Looking for a HUGE bow? Then you have found one of the largest chevron bows around! 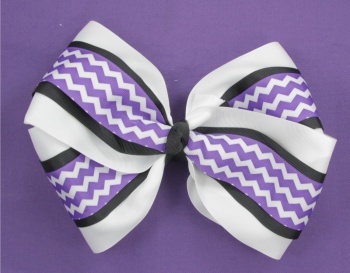 This is a triple layered bow that starts with a four inch white grosgrain ribbon on the bottom. 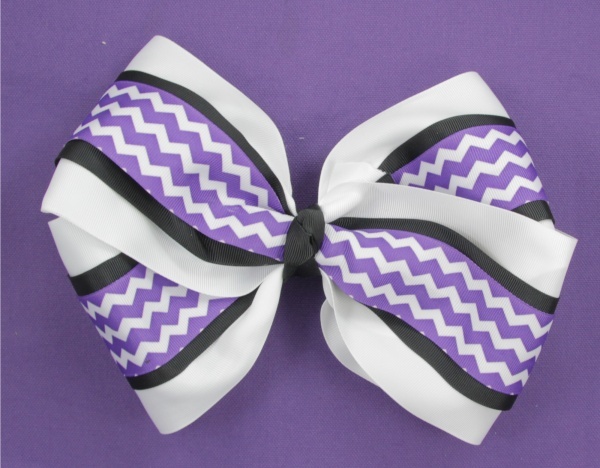 Then a 2.25" black grosgrain which is topped off with a 1.5" purple and white chevron ribbon and wrapped in the center with a black French knot. This bow will cover any young girl's head and she will love to show this big bow off to all her friends.